What is your first impression when you hear a rescued dog was sent to prison? Do you conjure up images that are not pleasant? READ THE INFORMATION AND GO BEHIND THE SCENES, WATCH THE VIDEO BELOW. I think you will be pleasantly surprised and your heart will pound, in a good way. There is an organization called 2nd Chance at Life. They place Greyhounds in prisons once they have been rescued. They have placed over 600 dogs nationwide. These dogs are fostered by the prisoners. What Does The Greyhound and Inmate Prison Partnership Do? ALL OF THE DOGS ON THIS POST ARE UP FOR ADOPTION! 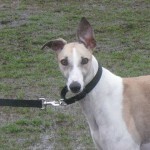 Who is a typical adoptable Greyhound? They’re really a 45 mile an hour couch potato!!!!!! Usually between eighteen months and five years old. They do not require a great deal of space to run, as many people think, but they do enjoy their daily walks. These ex-racers are intelligent, quiet, clean, good-natured, adaptable, sensitive, dogs who adjust readily to their new home environment. They are eager to please and respond positively to any attention. They provide their new owner with never ending loyalty and affection. 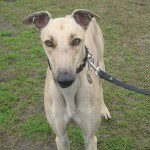 What does Gold Coast Greyhound Adoptions do? Find the best prescreened, match as possible for your family, with current shots, cleaned teeth. Prescreening includes cat testing that would help ensure compatibility with cats and other small animals. 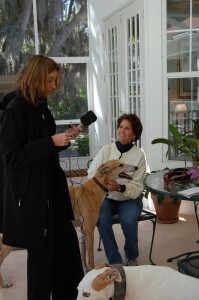 Find loving and qualified homes for the Greyhounds entrusted to our care. We spay/neuter provide vaccinations and make sure all Greys are in excellent health, including teeth. Provide ongoing support to those who adopt Greyhounds from Gold Coast Greyhound Adoptions, Inc. or any other group. Educate the public and raise awareness about the availability and suitability of retired racing Greyhounds as pets. Promote harmony and teamwork among all segments of the worldwide Greyhound community. How can someone adopt a prison trained or even a non-prison trained rescued Grey? There are a number of organizations where you can adopt these wonderful dogs. One that I know about, in my area, is Gold Coast Greyhound. 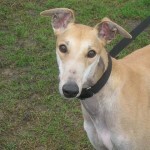 You can complete the adoption form from Gold Coast Greyhounds here. You can also call them at 941-312-1750. More Foster Homes Are Needed!! 3. 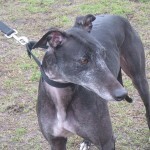 Provide ongoing support to the Grey and his forever home. 4. Great option for snow birds or anyone without a long term commitment. Everyone asks, “Is it difficult to give up a foster?” Yes and No. It’s very easy to develop an emotional attachment but when you place a happy Grey in his forever home with wonderful & caring families we are very happy! 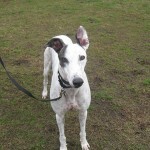 Then we know we can foster another Grey and help them find a loving home. If you cannot foster and cannot adopt, donations help support the cost of caring for our Greyhounds and preparing them for our prison training program. ALL OF THE DOGS ON THIS POST ARE UP FOR ADOPTION. Racing Greyhounds spend most of their lives in the company of other dogs, their trainers and handlers. Racing Greyhounds have all the advantage of breeding and training when it comes to being a good pet. Their social ability generally makes them great with other pets. Their temperament makes them wonderful around children and friends. Their intelligence and breed make them perfect house pets. 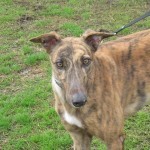 A clean, quiet loving companion, a well-mannered Greyhound could be just the pet for you. Just thought I would pass it along – I’m sure they’d be thrilled to get some coverage as well. This is fantastic! Great for the dogs, of course, but also great for the prisoners. Could be the best rehabilitation program for prisoners ever. Beyond teaching patience, responsibility, etc., I’d be willing to bet it helps prisoners develop compassion, too, which is a great crime deterrent! Great story, and it’s all true. We have had at least two greys in our home for more than 5 years now. They are wonderful dogs. Just one correction: they are large dogs but they do NOT need a lot of space, or even a yard. We live in a townhome w/ no outdoor space. We walk them outside (on leash) and they are just fine with that. Since they sleep a lot, are very graceful and body-aware (like ballet dancers or sprinters) they don’t bump into things and do just fine in tight spots. Also they rarely bark, which makes them excellent apartment dogs. (Can you say that about any small breed??) 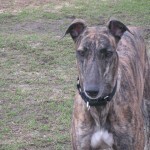 EVERYONE considering a dog should look into greyhound adoption. They are amazing animals! I’ve been looking for a dog and this breed seems to be the kind that my husband and I would like. I will talk with him about it. Thank you for posting the pictures of the dogs for us to see. I am so glad to read these dogs are getting adopted. I saw you had a post from China, it sounds horrific over there. Thank you for helping all of these animals. I really enjoy your posts. I look forward to seeing the show. Thanks for doing this post. We have already begun processing our first adoption from a viewer who has seen the news cast. 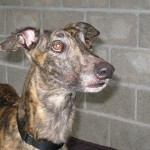 Others have expressed interest in adoption as well. We do not care for our animal like you. Lot of people kill animal in China. You have lucky dogs. This is heartwarming. Animals and humans do need each other. Once I got a greyhound that was it. I love these dogs! I never knew this about Greyhounds. I thought they ran all the time and needed a big yard and house. I learn something new from all of your posts. Thanks for all you do for animals around the world. With having had a Boarding Kennel for many years….I found the greyhounds to be some of the sweetest,most gentle dogs who ask for very little..very low maintenance, and are very ,loving and friendly to all. It seems they simply want to have a safe, loving place to land and make a wonderful family pet. Without adoption, they fate is horrific. Please comnsider one of these gentle innocents. Those are such great looking dogs. I sure hope they all find good homes very soon. I love this story. Thanks for brightening my day. Very interesting video. Seems the prisoners really bond with the dogs. What a wonderful story. Thank you.